Anyone who loves and lives with a cat knows that felines are heat-seekers. 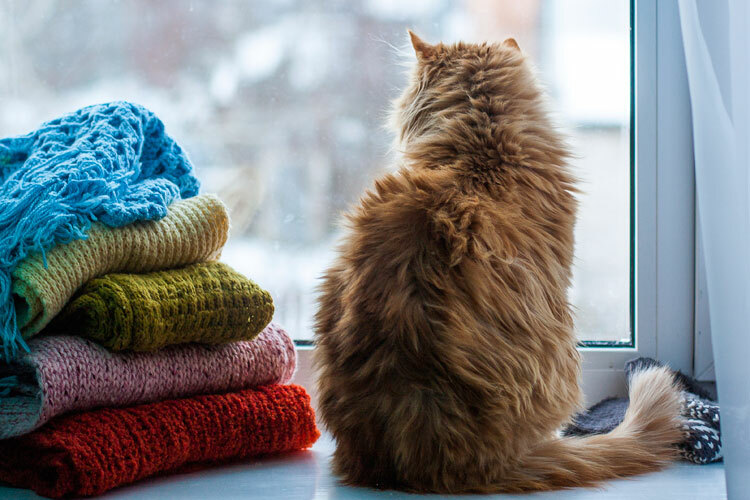 If there’s a warm spot to be found, your cat will find it, whether it’s a sun-puddle, a windowsill, or a fresh pile of laundry straight from the dryer. Cats are creatures of comfort, and the most comfortable cat is a warm cat. 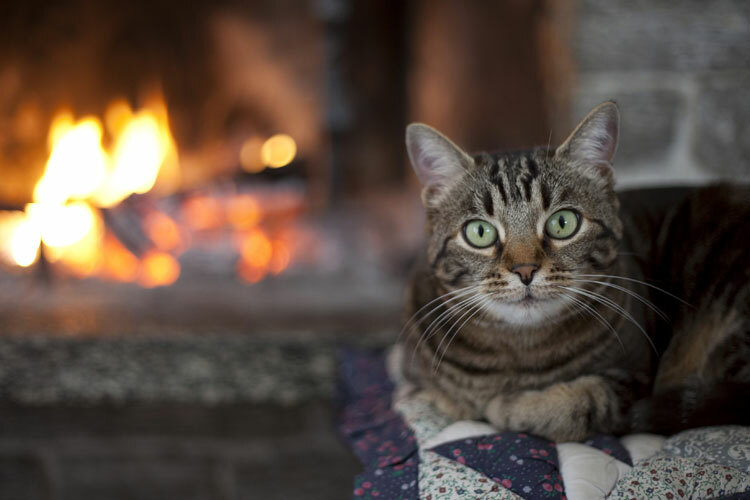 Here are some tips to make sure your cat enjoys a balmy winter. Q. Should I let my cat go outdoors in the winter? A. No! In fact, the best way to make sure your cat is safe and comfortable any time of year is to keep him inside. It’s as simple as that. With proper care, attention, and stimulation, an indoor cat will enjoy the best of all possible lives — all nine of them — in the safety and warmth of the great indoors. At North Shore Animal League America, we don’t adopt cats to people who intend to allow them outside. For their own safety and for the sake of the environment, cats belong indoors with people who are willing to put the time and energy into making them active, safe, and happy members of the family. Q. I’ve read that cats need more food in the winter. But I don’t want my cat to gain weight! A. You’re right to be concerned. Feline obesity is a serious health concern. However, indoor cats whose habits are steady from season to season don’t need more food in the winter. A cat might crave food out of boredom — who doesn’t? The best response is to play with your cat, not feed him. You’ll both find the experience immensely entertaining. That being said, studies have shown that cold weather can increase the appetites of both indoor and outdoor cats, even though the indoor variety lives in temperature-controlled environments. It appears that less natural light and more cold weather stimulate the appetites of all cats. Nevertheless, your cat is an individual. So check with your vet to find out how to maintain your cat’s optimum weight and health in any season. And remember, a balanced, quality diet will produce a healthy, thick coat…all the better to keep him warm. Q. My cat stays indoors. Do I still have to microchip her? Does it hurt? What if she gets out? A. Microchipping is absolutely painless and can save you and your cat from disaster. Just imagine that despite your best efforts, your cat scoots out a door during the cold winter months. A microchip will go a long way toward helping her return home. As soon as you realize what’s happened, walk slowly and calmly around the perimeter of your house calling her name. Frightened cats usually stay close to the warmth and protection of the house, rather than bolting into the open. They also look for sheltered hiding spots, like under the porch or deck, in an open shed, or in a garage. Next, put food outside to lure kitty home, as well as clean water. Make sure the food and water don’t freeze. Create a safe, warm, temporary shelter on your porch or nestled close to your house in case your cat returns when you’re not there to welcome her home. Or if you think your cat might “fall for it,” bait a humane trap with her favorite food. And be sure to follow commonsense steps to locate your missing cat. Begin by notifying your neighbors and ask them to check their garages and porches. Make and hang posters everywhere and contact local shelters, rescue groups, and veterinarians. All posters should feature a photo and accurate description of your cat. Q. I’m trying to save on heating bills this winter, but my cat seems uncomfortable. What can I do to help him without turning up the thermostat? A. First, create a few warm nooks so your cat can enjoy a variety of comfy places. If your cat has a special windowsill, make sure it’s draft-free. If your cat loves his cat bed, keep it off the floor in the winter. Floors get cold, which is why you wear slippers and socks. Check out the many products available to help your cat cope with winter weather, including heating pads. Some are electric, others are microwaveable, and still others are thermal pads that use the cat’s own body heat to reflect warmth. Whatever you choose, be sure to use pads designed for pets — and take care to follow directions. Many pads are activated by the pet’s weight and will heat only to a safe temperature to avoid burns. Heating pads are also a great comfort to senior cats who are dealing with stiff joints and arthritis. Be careful when it comes to fireplaces and space heaters. Flying sparks from a fireplace can hurt your cat, so remember to use a fire screen and keep your cat at a safe distance. As for space heaters, don’t leave your cat unattended in a room with a space heater. One jump could topple the heater and possibly start a fire. Cats with breathing problems like asthma should never be exposed to irritants like fireplace smoke or wood burning stoves. Q. I want to put my cat’s litter box in the basement or the garage. Is this okay? 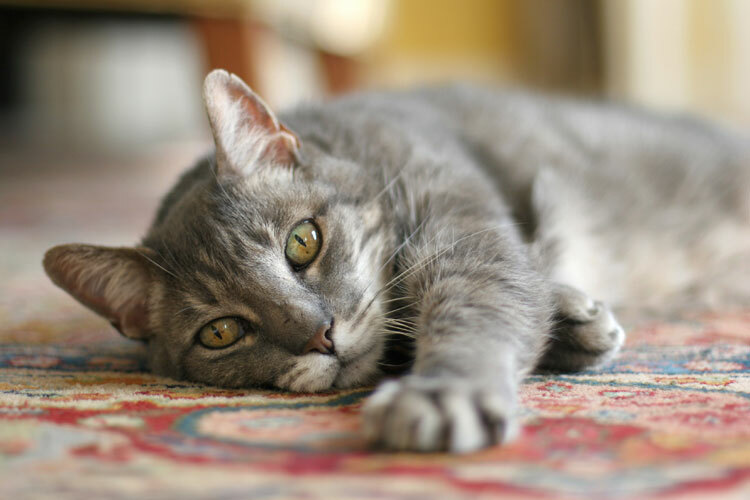 A. You’re not alone in wanting to keep the litter box out of sight, but basements and garages are cold, dank places, especially in the winter — and cats don’t like anything that’s cold and dank. So try to locate the litter box in and out-of-the way spot that’s convenient for you and inviting to your cat. If you make using the litter box an unpleasant experience for your cat, you might have to deal with some unwanted “outside-the-box” behavior in the future. 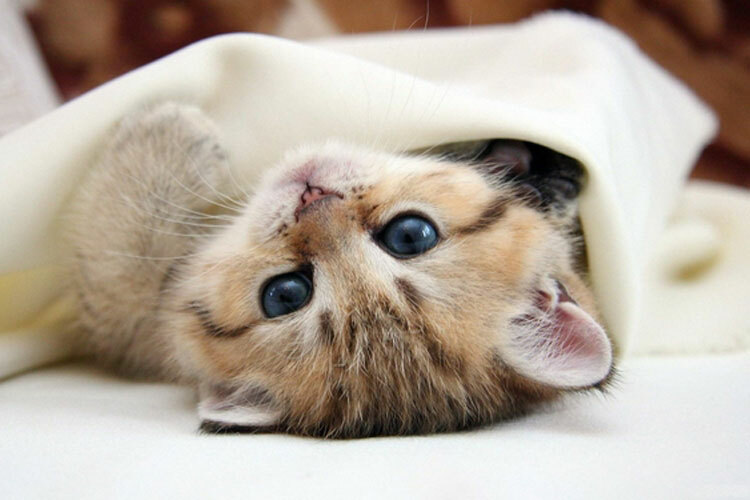 In addition, cats don’t like sleeping in cold, damp places. So treat your cat like a member of the family, and that’s what she’ll become! Q. I feel sorry for the strays in my neighborhood. Is there anything I can do to help? A. It’s heartbreaking to see a cat suffering outside on a frigid winter night. You’re right to be concerned. There are a few simple things you can do. First of all, just because you’re a conscientious cat person doesn’t mean your neighbors are. So remember, strays or cats left to roam in winter will seek spots away from the wind and cold. Very often they climb into warm car engines to escape the harsh weather. If you have strays or roamers in your neighborhood, be sure to check around your car, honk the horn, and bang your hand on the hood a few times before starting the engine. You might also want to leave out food and water in heated bowls for the local cats. If you decide to become more involved with caring for ferals and strays, check with your local shelters or vets. Most communities support nonprofit trap/neuter/release (TNR) programs that would love to have you as a volunteer. And remember, they’re worth it. The companionship of a cat is one of life’s great joys. Nothing sooths the nerves or centers the soul like the sound of a contented, purring cat. The great French writer and artist Jean Cocteau adored cats, summing up their power in this lovely quote: “I love cats because I love my home, and after a while they become its visible soul.” Keeping your cat warm and happy is surely the least you can do in exchange for such a gift. Q. I heard that cats shed only in the spring and fall. Does that mean I don’t have to brush my cat in the winter? A. The fact is, indoor cats shed all year long, with the heaviest periods being the spring and fall. That means year-round brushing is in order to help your cat keep his coat healthy and thick. Shedding is your cat’s way of removing dead fur and stimulating new growth. Gentle, daily brushing not only removes loose hair, it also keeps skin healthy. As a bonus, more brushing means less hair on your clothes and in your vacuum. If your cat has long hair, it’s crucial to remove hair mats so kitty can grow a warm, protective coat. Q. Should I take special precautions in my house to protect kitty during the winter? A. Yes, and most of them apply to every season. For example, if you have a basement or an attached garage that you allow your cat to explore, be careful to store antifreeze, batteries, deicers, cleaning products, and other chemicals securely out of reach. Even a tiny amount of these substances can kill your cat. Call your veterinarian immediately if you think kitty has ingested anything that might be toxic. For us humans, winter means catching colds and getting the flu, so be judicious about putting your medications safely away. Everything from decongestants and aspirin to Advil and Tylenol can cause seizures and death in your cat. Prescription medications are equally hazardous, so keep that medicine cabinet door closed tight. What’s good for you is probably deadly for your cat. Houseplants can also pose a serious threat to cats. Very often, when we bring our plants in for the winter, we’re unwittingly exposing our cats to potential poisoning. The list of poisonous plants is long and includes everything from the amaryllis to the peace lily to the tulip. Find out if any of your houseplants or floral arrangements are dangerous and, if so, give them to someone who doesn’t have a pet.